A strawberry banana smoothie is one of my favorite smoothie flavor combinations because it tastes absolutely delicious and reminds me of childhood. This iconic pink drink is often one of the first fruit smoothies people tried back in the days before green smoothies became popular. I have my own happy memories of making these cool drinks on hot summer afternoons back in high school. A strawberry and banana smoothie makes the perfect breakfast or afternoon snack, and it’s an easy meal you can feel good about. Instead of grabbing a preservative filled, hot pink yogurt, make your own! You’ll know what is in it and you can control the sugar better, plus fresh strawberries and bananas are a great way to start the day. It is as easy as one, two three! There’s even a Strawberry Banana Pop recipe! I also recommend you check out our recommendations for smoothie blenders if you want a nice blender that helps you drink better strawberry banana smoothies. What is a Strawberry Banana Smoothie? Strawberry banana smoothies are a sweet, cold drink typically made by blending together just 3 ingredients: strawberries, bananas, and milk. Sometimes yogurt, almond milk, soy milk or ice is added to improve the creaminess and thickness of the recipe. 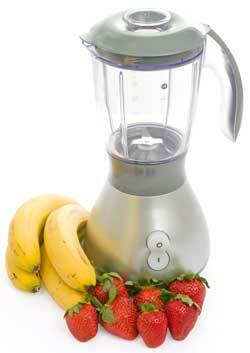 The main fruits in a strawberry banana smoothie recipe provide a lot of nutritional benefits. Bananas are rich in fiber, antioxidants and several nutrients. The high amount of potassium in bananas helps decrease your risk of kidney stones. They’re also high in fiber and resistant starch, which helps feed the friendly bacteria in your gut and help protect against colon cancer (1, 2, 3). Strawberries are a good source of vitamin C, manganese, folate and potassium, as well as several other vitamins and minerals. They’re very rich in antioxidants and certain plant compounds that have heart health benefits and may help control blood sugar (4, 5). 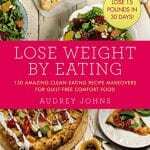 Depending on how it’s made, a 12 ounce serving contains around 188 to 210 calories, is usually low in fat, and contains a good amount of protein (between 2 and 16 grams). They can be higher in naturally occurring sugars, so it’s important not to add more sweeteners (like sugar or honey) than is necessary to sweeten it. Use no sweeteners if possible. 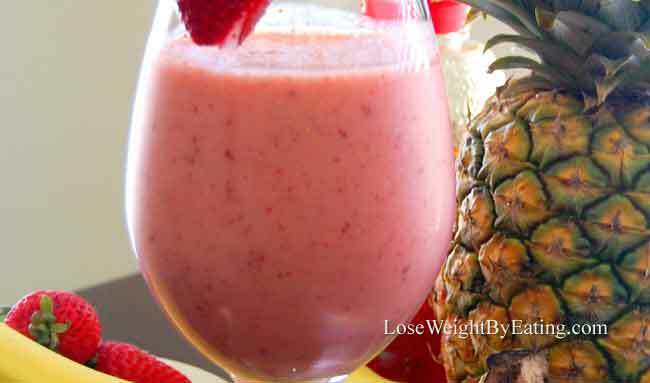 Strawberry banana smoothie recipes are fairly simple to make. Freeze the fruit, or buy frozen fruit. Add ½ to 1 cup of ice. I recommend you visit your local Farmer’s Market, it is a great place to pick up fresh fruits and veggies, and wonderful organic jams like the strawberry jam I use in this recipe. Plus you are supporting your local economy! Here are some of my favorite strawberry banana smoothie recipes I found to give you some ideas. Always feel free to experiment with new ingredients, just try to avoid adding too much extra sugars. 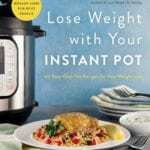 All recipes make about 2 servings. This is the original Strawberry Banana Smoothie recipe that the whole world loves. It’s incredibly simple to make and the perfect way to cool off on a hot day. It’s easy to whip this one up with ingredients you probably already have at hand. Fresh strawberries are preferred, but frozen will work just as well if fresh is not available. 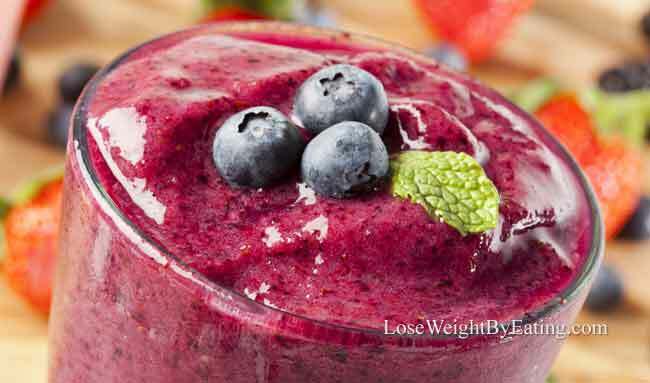 This is a really delicious smoothie recipe that’s very high in antioxidants and is very kid friendly. My daughter loves the taste and distinct color of this recipe, and asks for it often. 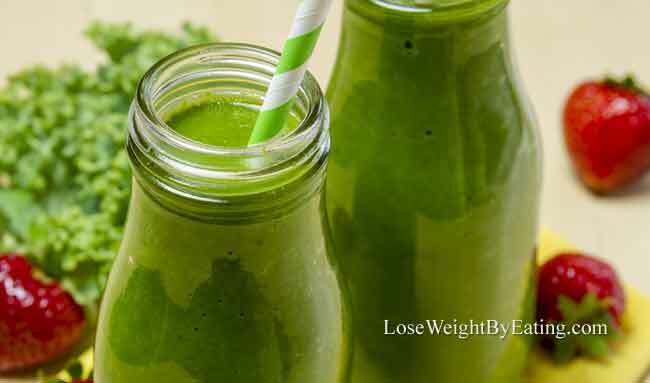 This is a good recipe to start your day off with, it’s easy to make and contains a lot of powerful nutrients. It also tastes really good, too. Kale is known as the king of superfoods. It’s one of the most nutrient dense foods on the planet, and it’s flavor blends very nicely with the banana and strawberries. Kale is very high in antioxidants, vitamin C, and has even been known to help reduce the risk of heart disease (10, 11). When I’m in the mood for a tropical flavored drink that doesn’t include alcohol, this is my go-to recipe. For me it doesn’t get any better than my two favorite ingredients, strawberries and bananas, combined with my third favorite ingredient, pineapple! Pineapples are a great source of many nutrients, like vitamin C, copper, manganese, and folate. Pineapples are also the only source of the plant compound called bromelain, which is know for many health benefits like improving immune function, helping prevent certain types of cancer, faster wound healing and better intestinal health (12). If you’re looking for a vegan strawberry banana smoothie recipe, this is the one for you. It’s basically the same as the classic strawberry banana smoothie recipe but with almond milk instead of skim milk. Almond milk has a nice nutty flavor, that is very similar to real milk in texture and creaminess. It’s low in calories, is naturally rich in several vitamins and minerals, dairy free, and generally low in carbs (13). This is just about one of the healthiest, fast breakfasts you can make. It’s simple to toss together and you get a lot of nutrients and fiber in this one. Oats are one of the healthiest grains on the planet. They’re gluten free, incredibly nutritious, and full of soluble fiber which helps lower your bad cholesterol levels (14). This is another tropical flavored strawberry banana yogurt smoothie that’s one of my family’s favorites. It’s the perfect drink to have poolside on a hot summer day, without all the drowsiness of alcohol. Mangoes contain high amount of vitamins A and C, as well as lots of antioxidants and soluble fiber. They’re also high in certain plant compounds that may help reduce the risk of oxidative damage and cancer (15). Have you ever tried a chocolate covered strawberry? How about a chocolate covered banana? 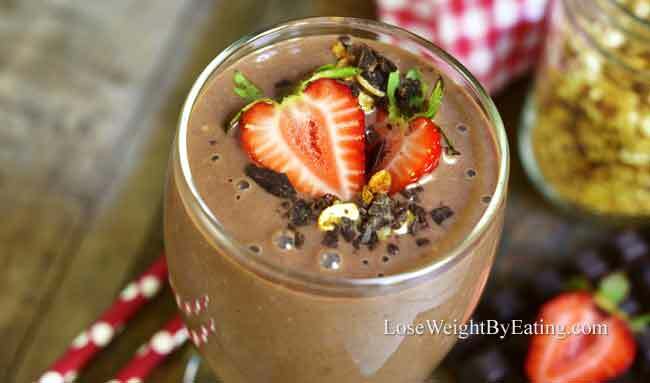 This Chocolate Strawberry Banana smoothie combines BOTH of these awesome flavors into one delicious drink that my family loves. Cocoa is considered a “super fruit” thanks to the very high antioxidant capacity and levels of naturally occurring compounds such as polyphenols (16). OK, this isn’t exactly the healthiest smoothie recipe out there, but what Strawberry Banana Smoothie list would be complete without it? This is what we tell our daughter is a “sometimes treat”. Once in awhile is ok to enjoy, but I don’t recommend having this every day if you’re trying to lose weight or stay healthy. 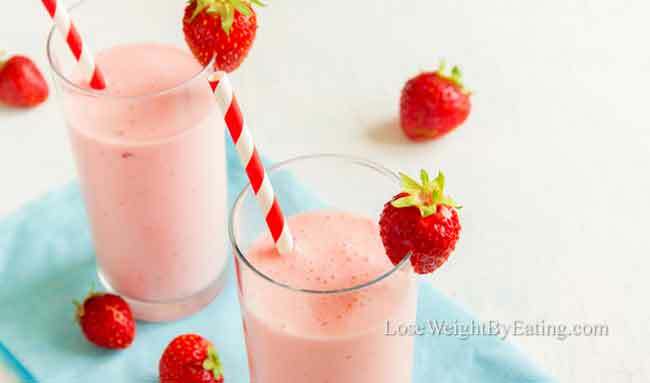 I recommend using nonfat yogurt to cut down the calories in this banana strawberry smoothie, but regular ice cream is OK if you’re just having this as a special treat. 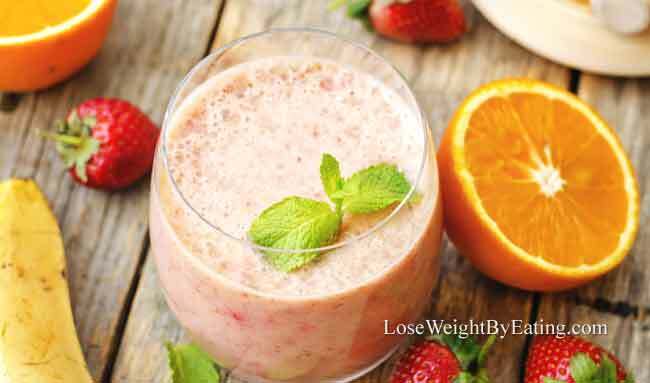 The flavor of oranges goes really well with strawberries and bananas in this delicious banana strawberry smoothie recipe. 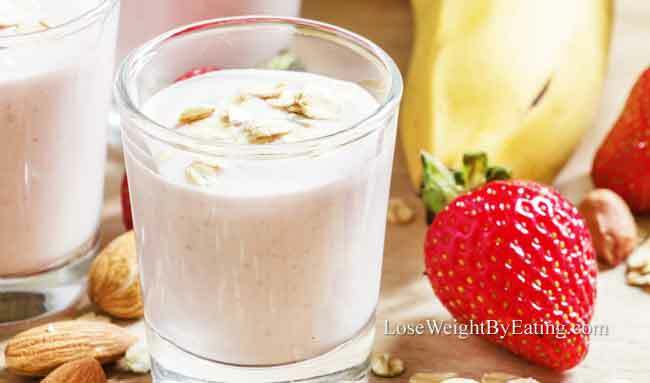 It adds a nice tanginess that you don’t get with the other Strawberry Banana Smoothie recipes. Oranges are very nutritious as well as delicious. They contain healthy amounts of fiber, vitamin C, thiamin, folate and antioxidants. They also can lower blood pressure in people with hypertension and help improve cardiovascular health (17, 18). This is a creamy banana strawberry smoothie that I personally love to drink. 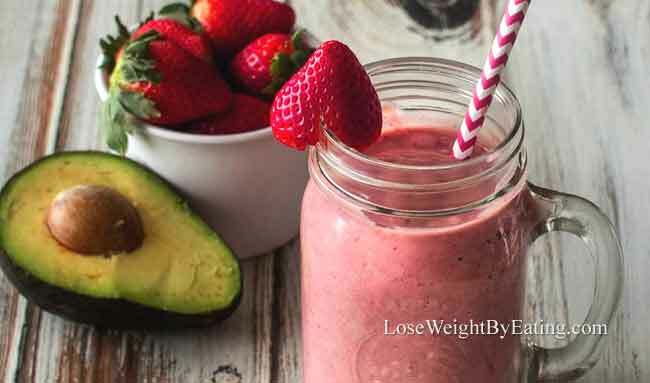 The flavors of the strawberries, banana, and avocado blend together quite nicely into a strawberry banana Greek yogurt smoothie that tastes delicious. Avocadoes are a very powerful fruit (yes, fruit) with some amazing health benefits, including faster weight loss, improved joint health, better digestion, and healthier joints. 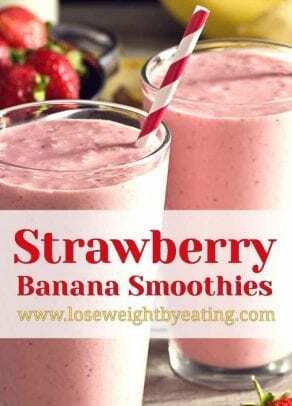 The beauty of all these healthy Strawberry Banana Smoothie recipes is that they make a good base to add more healthy ingredients without altering the flavor too much. In this recipe, we’ve added Chia seeds, which you actually can’t taste but help add a lot of nutrients. Chia seeds are actually among the healthiest foods on the planet. They pack a ton of vitamins, and have some special health benefits including providing lots of antioxidants, fiber, protein, and beneficial Omega-3 fatty acids (19, 20). These Strawberry Banana Smoothie Pops are amazing! 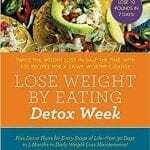 Try them out for yourself and while you are digging in, smile because you know they’re good for you too. My daughter LOVES these! The Greek yogurt is full of protein and calcium, plus it boosts metabolism. Bananas and strawberries are full of potassium for strong muscles and calcium for strong bones (21). Makes 4 Strawberry Banana Smoothie Pops. In a medium shallow bowl smash the banana with the back of a fork until it is mush, add in the yogurt, Skinny Strawberry Sauce and vanilla, mix well. Add to your Popsicle Molds and place in freezer until solid 6-8 hours. 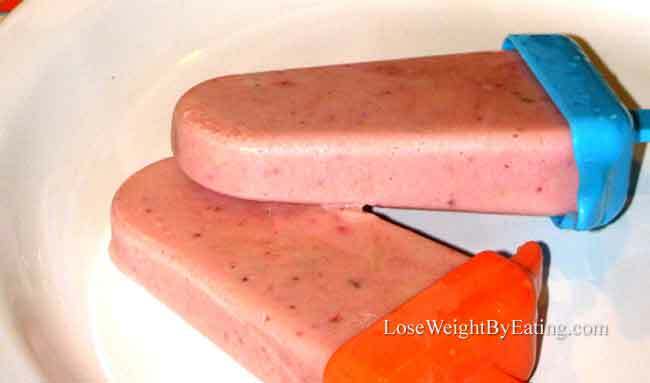 Let stand out of the freezer for 5-10 minutes before serving so they slide out of Popsicle Molds easily. When it comes to sweet, healthy smoothies, the Strawberry Banana Smoothie is the king of them all. It’s so easy to make and tastes delicious, making it a great treat for you or your family to enjoy anytime without all the sugar of a milkshake. Just be sure to keep the sweeteners (like sugar or honey) to a minimum to avoid adding too many calories to these recipes. The best strawberry banana smoothie recipe is the one you enjoy the most with the least amount of sugar. Please share your favorite recipe in the comments section below, and Happy Cooking!